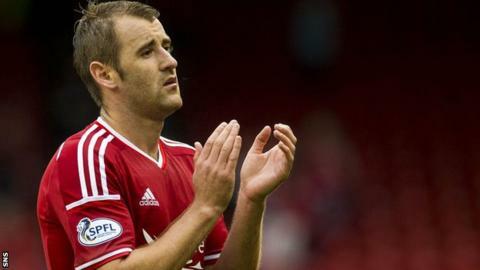 Niall McGinn insists moving to Aberdeen has revitalised his career, after signing a new contract at Pittodrie. The 27-year-old agreed a deal that keeps him at the Dons until 2017. Following spells at Celtic and Brentford, McGinn is delighted to be enjoying his football again. "Since I came here I've loved every moment, winning the trophy [League Cup], playing lots of football, getting my career back on track again," the Northern Irishman said. "It's helped with the international games as well, I've been involved a lot. Over the last few years it's been very exciting," added McGinn, who signed for Aberdeen in July 2012. "I'm over the moon. The gaffer pulled me in a couple of weeks ago and said there was another year for me, and it was a no brainer for me to get it done and dusted. "I'm just thankful to be at a good club and enjoying my football, it's a great time to be here." Striker Adam Rooney also extended his Aberdeen contract, as did youngsters Lawrence Shankland and Scott McKenna. And 26-year-old Rooney, who has hit 17 goals this term, was thrilled to commit to the club until 2018. "It's been great since I came in here," the Irishman said. "I've really enjoyed my time and it's been a really good time for the club as well. It's been nothing but positive around the club and the city so I'm delighted to extend my deal." Manager Derek McInnes shared in the players' delight at news of their contract extensions, ahead of their meeting with Inverness Caledonian Thistle at the weekend. "Niall and Adam are coming into the peak of their careers and they're going to be spending it with us, so we're delighted that they have committed to ourselves," he said. "They see it as a happy place to be, both players were easy to deal with, it needs to be said, there's no extra incentive for them to sign on a financial basis, they were just happy to commit and that's brilliant. "The players are really buying into what we're trying to do here and they see the club going forward and they want to be part of it." McInnes, who refused to comment on speculation linking the Dons with a move for Inverness' Graeme Shinnie, revealed he may look to add "one or two" new players to his squad in the January window, but added: "If not we move on, because I believe this squad can achieve results."